The Trini-Tones will be singing a Spring concert at the Grotto on Sunday, April 28th at 4:00 pm. The Padula string trio will be performing along with the choir. Come enjoy some beautiful music with us in this gorgeous setting. Cost: Free, and accepting donations of canned food for the St. Vincent de Paul food pantry. What do friendship and learning have to do with each other? Please join Trinity Academy for a free public lecture on the topic by University of Dallas Provost Dr. Jonathan Sanford. You are cordially invited to the Commencement of the Class of 2019, June 8th at 2:00 pm. The Commencement will be held at Hinson Memorial Baptist Church with a reception following. We hope you can join us in celebrating the accomplishments of our seniors! The Junior and Senior classes present a play of Orson Welles' radio drama, which aired in 1938 and was an adaptation of H.G. Wells' 1898 science fiction novel of the same name. The Trinity Academy Sixth-Grade Class presents their production of the much-beloved classic, The Lion, the Witch and the Wardrobe, by C.S. Lewis. Come and hear how Trinity Academy is educating students in grades 6-12. Dr. Joannah Clark will give a presentation on the curriculum and culture of Trinity Academy and will answer any questions you may have during this informal evening. There will be the opportunity also to meet some of our teachers and students. We look forward to meeting you! Engaging Culture or Engaged to Culture: For Christians who want to be in the world, but not of the world. High school aged students and adults encouraged to come! The Trinity Academy Junior and Senior classes will be performing The Mousetrap, a classic murder mystery by Agatha Christie. Please join us on Saturday May 21st at 7:00pm for a night of musical performance and art exhibition! 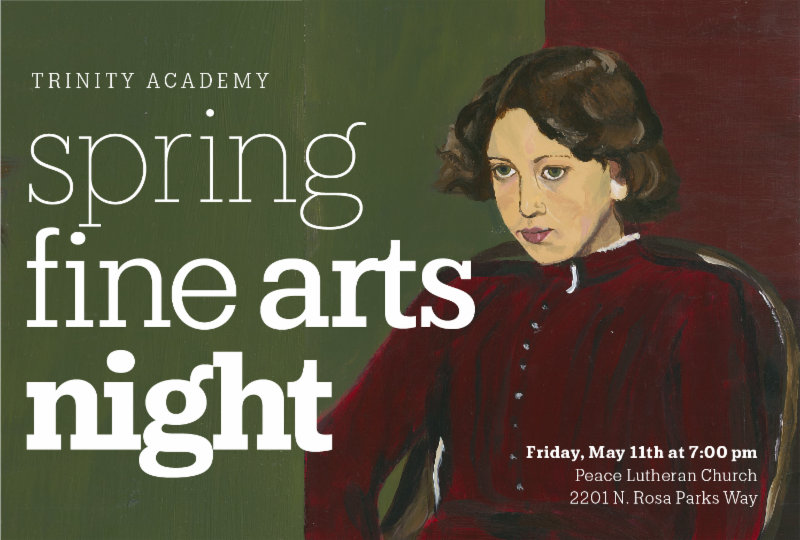 A concert of our junior high choir, high school choir, and the Trinitones will be followed by a reception with Trinity Academy student art exhibited.